Add fun and excitement to game night with ScoreGeek! Track any board game's scores, see detailed statistics and compete to unlock achievements. 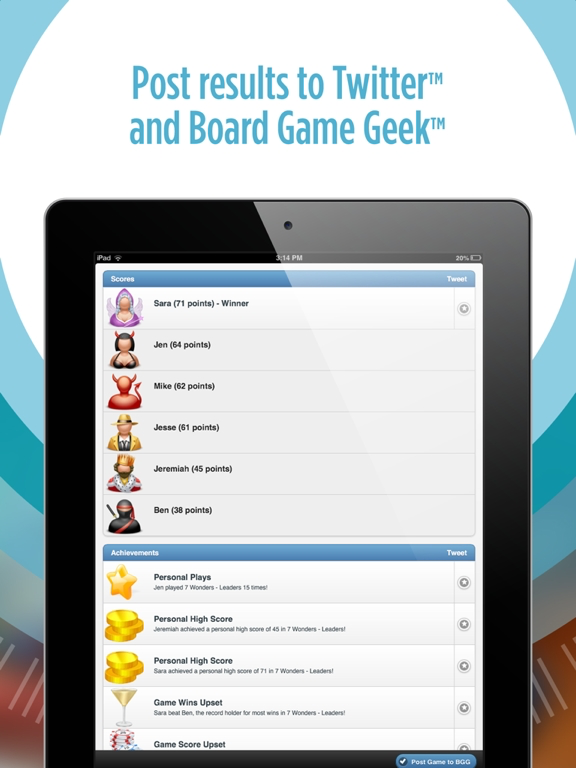 ScoreGeek is the ultimate app for board game fans! 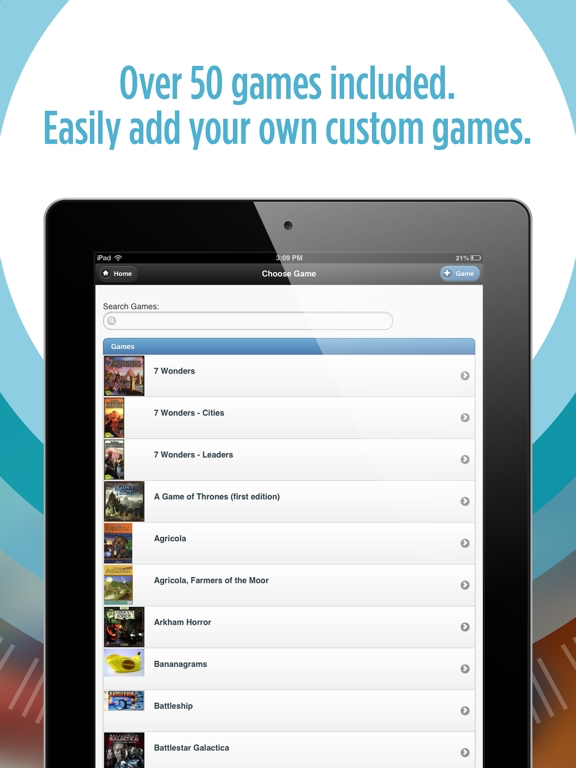 • Game Library Choose from an ever-growing library of game plugins that make scoring faster, easier and more interesting. For example: 7 Wonders: Calculate your science card points automatically Agricola: Select animal ranges from a drop-down list Terra Mystica: View wins, average scores and high scores by faction Over 100 games are available now and more are being added all the time. You can browse the game library at http://rebrandcloud.com/scoregeek • Custom Games It only takes a moment to add a custom game to track scores, history and achievements. You can even search BoardGameGeek for the game name, ID and artwork. After creating your game it’s easy to share it with the community. • Achievements Do you have the current high score? Did you beat your personal best? Are you on a winning streak? Now you’ll know for sure. • History Your entire game history is now at your fingertips. View details about each session including: game, date, players, teams, colors, factions, scores, notes, location, achievements and photos. • BoardGameGeek.com and Social Integration Full integration with BoardGameGeek.com lets you automatically post your plays to The Geek. 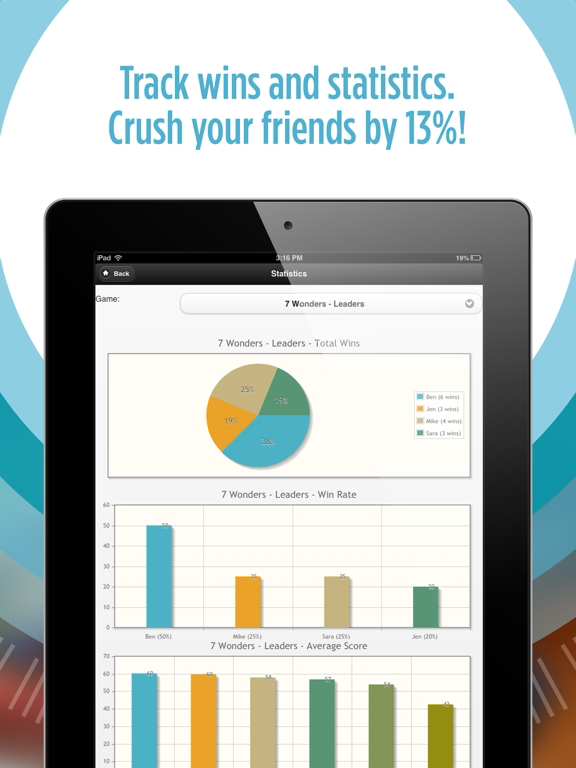 Social integration lets you share your session photos, scores, achievements and stats with your friends. • Free Cloud Storage Automatically keep your scores backed up and synced on all your devices. Your gaming group can even share a cloud account: score a game on any member’s device and it will sync to all member’s devices. • Other Fun Stuff There are so many other fun and useful things: a photo gallery, session timer, unlockable player avatars, meta game achievements, score widget API, favorite games, history filters, backdated sessions and more! Try it today and make your next game night a little bit more awesome! I just wanted to comment on here that this app is amazing. It is way easier to use than a lot of the custom scoring apps that I've found out there designed for specific games -- the interface is clean, easy to use, and storing scores for posterity is a nice fringe benefit. The other night we scored a five player game of Agricola in under a minute, which was mind-blowing, at least for us. 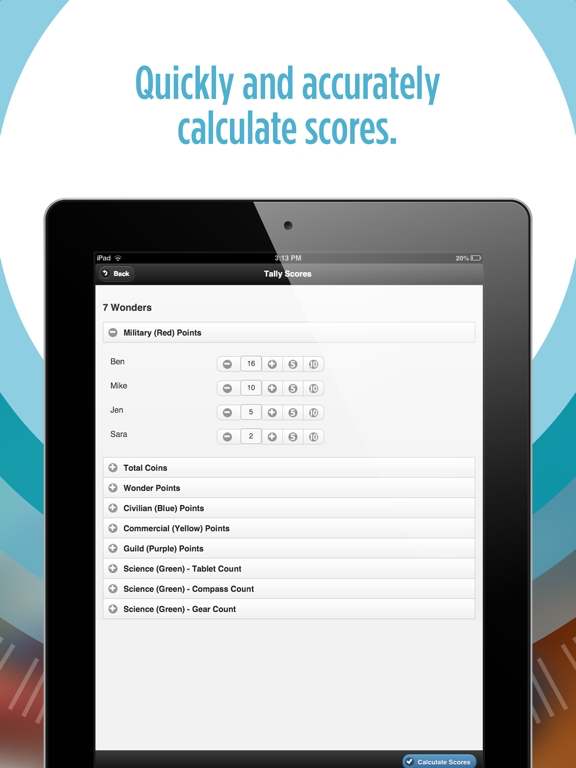 If you're thinking of getting a scoring app, seriously just pick this one up. Love this app...just what I have been looking for for a long time. You can keep score of any game and have a history. My family is very competitive and likes to see a long term history of their scores and how they compare on single games or all games. Great job! Thanks! If you get one score tracking app, make it this one. The depth and flexibility of the score tracking is mind boggling. Also nothing quite like waiting for the achievements to be generated at the end of game and finding out you just set a record high score.